Here we are, almost exactly in the middle of Norfolk, with St Mary on a hill as if surveying its estates. In almost any other county, this splendid church would be far better known. As it is, there is one particular feature of it which is renowned above all others, which is a pity, because this is a building full of interest, with lots of medieval details, and not difficult to read and understand. 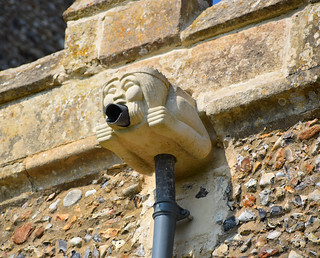 St Mary is unusual in that it was all built in one go. Even more unusually, this happened early in the 14th century, before the Black Death made us all serious, and as such it is not at all typical for East Anglia. This is a Decorated building with hardly a single Perpendicular modification. It is almost as if the 15th century had never happened. Inevitably, such a forceful statement is a result of the ruthlessness and ambition of a single family, a single man. This building is pretty much a mausoleum to Sir Hugh Hastings, as though it was a pyramid commissioned by a Pharoah. Although the roofline is rather stark, there is much to admire about the outside, especially those gorgeous windows. 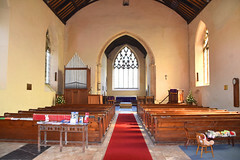 St Mary is a wide church, but there are no aisles - it is a single span nave roof of just over twelve metres, the biggest in East Anglia and one of the biggest in England. Because of this, you step into a huge space which swallows sound, a sense of awe enhanced by the clearing of the Victorian pews from the west end of the nave. This serves as a perfect foil to one of the few Perpendicular features, Elsing's magnificent font cover, a riot of pinnacles and niches that climbs into the roof. 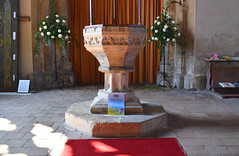 It is mid-15th century, and sits on a font a century older, commissioned and placed in the rebuilt church of the 1340s, and as such also not at all typical of the fonts of Norfolk and Suffolk. The glass in the east window is clear, as it is in the huge arched windows of the nave. A space so wide and high-pitched as this is full of light, as if the building were the air itself, not merely the walls containing it. 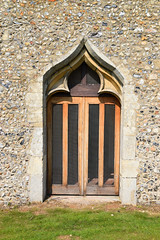 This is an achievement of the architecture, but these windows were once filled with coloured 14th Century glass, of which only fragments remain. Perhaps here are enough to comprehend what it must once have been like. There was a range of large images of the twelve Disciples holding scrolls with clauses from the Apostles Creed. They once filled the nave windows; three of them survive, reset in the chancel. 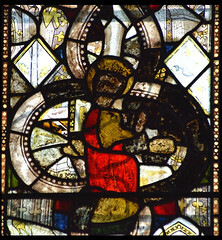 St Jude holds his ship, St James the Less his fuller's club, while the third has lost his inscription, but may well be St Simon. 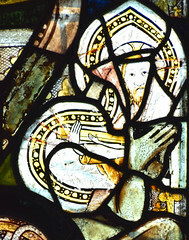 They are reset among fragments of 15th Century glass, which provide ome interesting details. Of greater interest, though less delightful perhaps, is a Madonna and Child that is clearly pre-1350 and so probably dates from the opening of the building. It is rather hard to make out, as it has become discoloured. 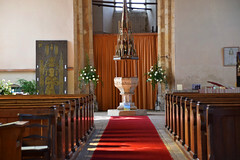 Just to the south of the font is the Pharoah himself, or, at least, his image in brass - well, a replica actually. 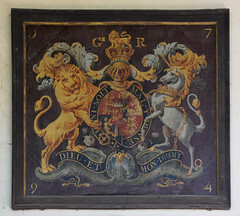 The original is up in the chancel, covered by a locked box. It can be seen, but the replica is more interesting, simply because it is more complete. The original can be dated accurately to 1347. Hastings stands piously under an elaborate canopy, his pillow carried by angels. 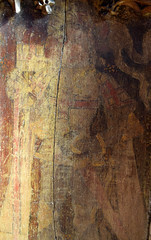 Above his head, a Sainted figure arises from winding sheets unwrapped by angels - presumably, Sir Hugh entering into Paradise - and above that a proud St George. 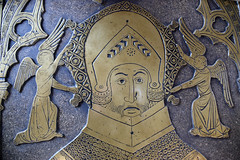 Hastings is flanked by other figures, less apocryphal but equally martial, including Edward III. Surmounting everything is the Coronation of the Queen of Heaven. 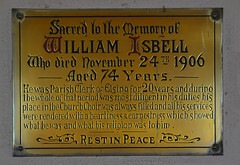 Yes, the brass is magnificent; the font cover is impressive, and the glass is very interesting. 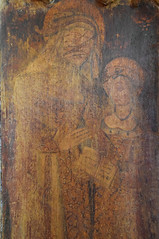 But my favourite medieval survival here is the set of painted panels on the rood screen dado. They seem to be little known, possibly because it is only a recent restoration that has really enabled the subjects to be identified. 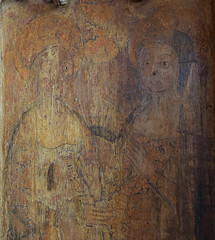 There are eight panels, and the first two on the north side appear to be St Margaret and St Dorothy. But it is the next two subjects that are of most interest, because the third is the Visitation, with the Blessed Virgin meeting a very pregnant St Elizabeth and touching her tenderly. The fourth panel depicts an earlier incident in Mary's life, St Anne teaching the Blessed Virgin to read. On the south side are four men. 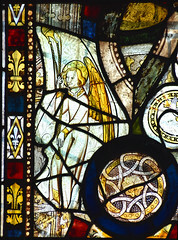 The first two panels show St Michael weighing souls and St George killing a dragon. 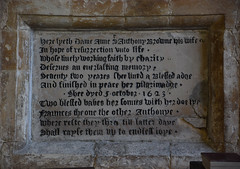 The last two are harder to decipher, but may be St John the Baptist and St John the Evangelist. 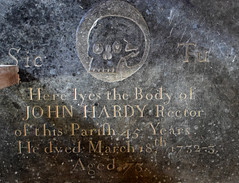 There's a royal arms, a memorial or two, a splendid 18th Century ledger stone to a former rector depicting a skull with the simple inscription sic tu ('thus you'), though they are a bit lost in this vast space. But that doesn't matter. 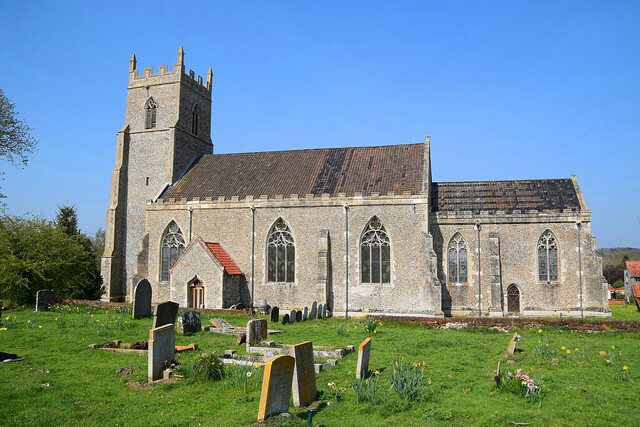 Architecturally and historically, St Mary is in the first rank. Not only is this a church of uncommon interest, it is beautifully kept and very atmospheric. 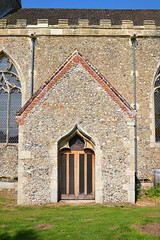 It deserves the visitors it gets, but there would be many more if it was not in such a remote village in the centre of Norfolk, I think.